WOW! FABULOUS MOUNTAIN VIEWS and miles of state land as far as the eye can see! You will absolutely love this FABULOUS BACKYARD boasting... extended paver patio with LARGE FIREPIT with built in seating, BBQ ISLAND, therapeutic spa and IMPRESSIVE PERGOLA too! Fantastic kitchen with GORGEOUS GRANITE counters, tasteful STONE TILE BACKSPLASH and detailing, LARGE CENTER ISLAND and large walk in PANTRY! Upstairs has LARGE LOFT/sitting room, SPACIOUS MASTER SUITE with INCREDIBLE VIEWS from every window, master bath with SEPARATE TUB & SHOWER w/beautiful stone tile and BIG WALK-IN CLOSET! 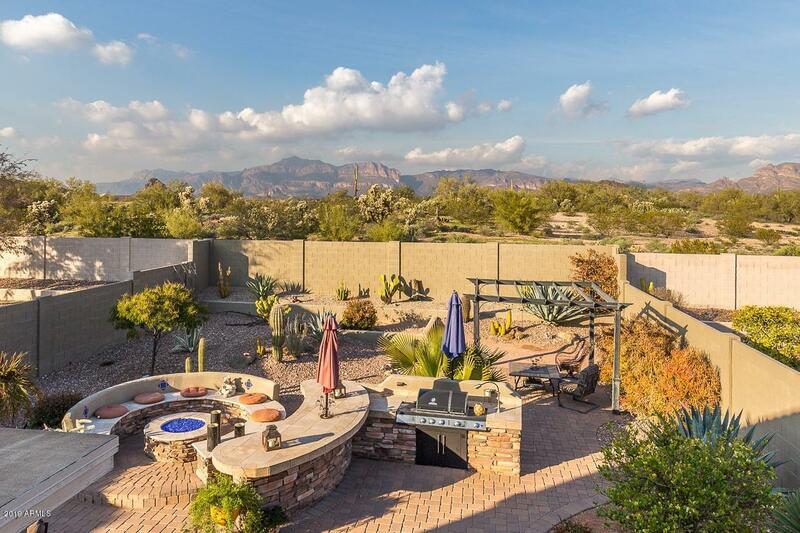 Entrada Del Oro subdivision is surrounded built by state land for convenient, DIRECT ACCESS & fun for 4x4 adventures! DON'T WAIT TOO LONG...MUST SEE!